As this reviewer recently noted: “The Arthurian legend, the story of Camelot, is one of the tales that has remained in our culture over the course of centuries. It has been adapted to virtually every medium and with varying degrees of success.” While I said that to introduce a review of the new DVD release of First Knight, I could just as easily have said it to introduce this review for Disney's The Sword in the Stone – 45th Anniversary Edition. Though the two movies focus on the extremes of Arthur's reign, with First Knight depicting the end and The Sword in the Stone depicting the begin, they certainly both belong to the same canon. Originally released in 1963, the Disney feature is an animated take on how Arthur (or “Wart” as he is styled in the movie and the T.H. White book upon which the film is based) became King. Disappointingly for some viewers, it is only in prologue and the waning moments of the film that said sword in the stone actually make an appearance. 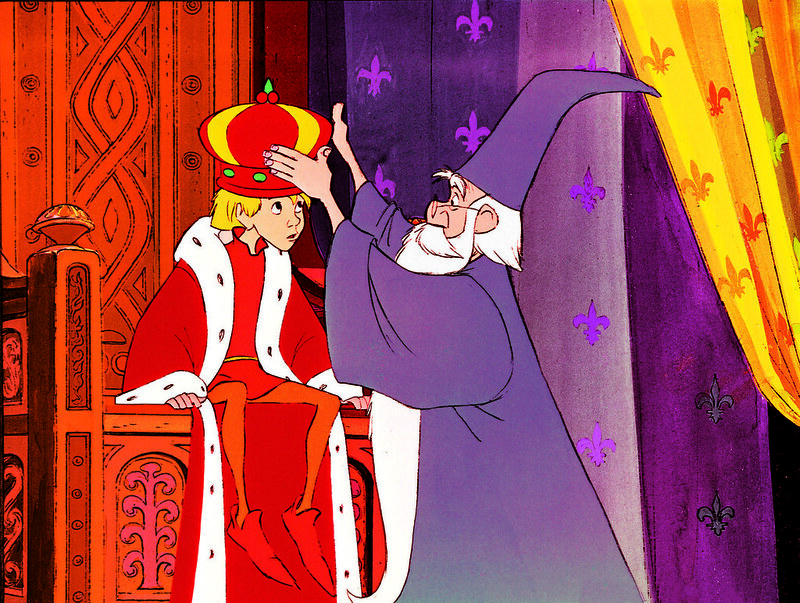 The majority of the film is focused on Arthur's meeting Merlin and learning from Merlin important life lessons, lessons that the boy would eventually use as King. 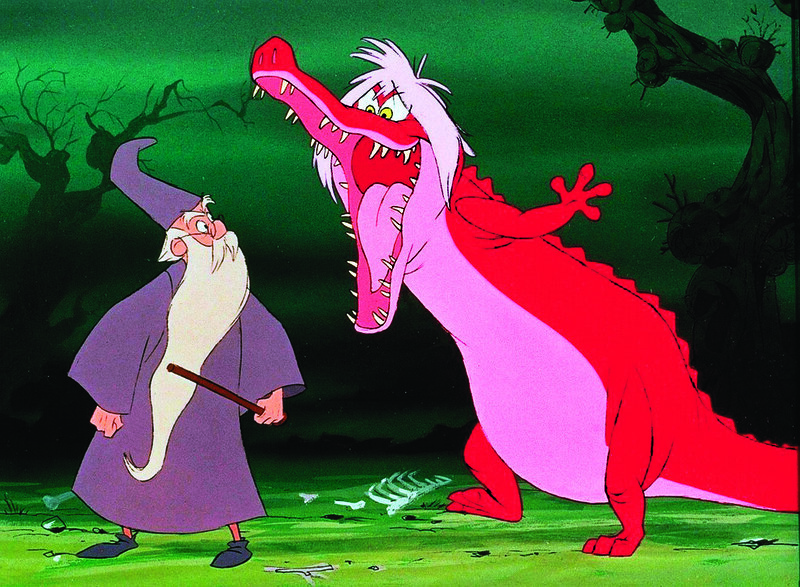 Much of the film finds Merlin transforming Arthur and often himself into various animals – fish , squirrels, and birds. Merlin may not realize that Arthur is destined to be King, but does recognize that Wart is somehow significant and needs to be taught about life. Through the transformations, Wart learns to use his brain instead of solely relying on strength, and that there are certain forces in nature that one is powerless to stop. While these various segments in the film are vaguely, and momentarily, amusing, the true star of the show is Merlin himself. There are moments when he is addle-brained and goofy, but underlying that veneer is the sense of an incredible intelligence at work (one that would, perhaps, rather be at play). On the opposite side of it all is Sir Ector and his son Kay. Wart lives with Ector and is being groomed to become Kay's squire when Kay becomes a knight. One senses that Ector likes the boy more than Lady Tremaine liked Cinderella, but there is still the feel of wicked-stepmother about the relationship. Ector wants the best for Wart, but certainly places a premium on his own flesh and blood. Despite having the feel of classic, old school, Disney animation and a wonderful pedigree, The Sword in the Stone, disappointingly, in bits and pieces than as a single whole. There are moments in it that are as much fun as anything the Mouse House has put on film, particularly Merlin's first meeting with Arthur and his battle with the evil sorceress Madam Mim at the end of the movie, but there is simply too much lag in the middle. The changing into various creatures, fun at first, is eventually less enjoyable. One of the other saving graces of the film are the musical sequences. Some are understated and somber whereas others are over the top and laugh inducing, but they all help make the film. Included on the new DVD release is a short featurette on the Sherman Brothers who wrote the songs for the film and a menu from which the song sequences can be accessed directly. Other special features included Walt Disney talking about (and performing) magic tricks, a scrapbook of photos and drawings from the film, facts about t he film, and the shorts “A Knight for a Day” and “The Brave Little Tailor,” both of which are true classics. There is also an interactive game, “Merlin's Magical Academy” which has the player answer questions and perform various tasks as assigned by Merlin in order to complete one's education. 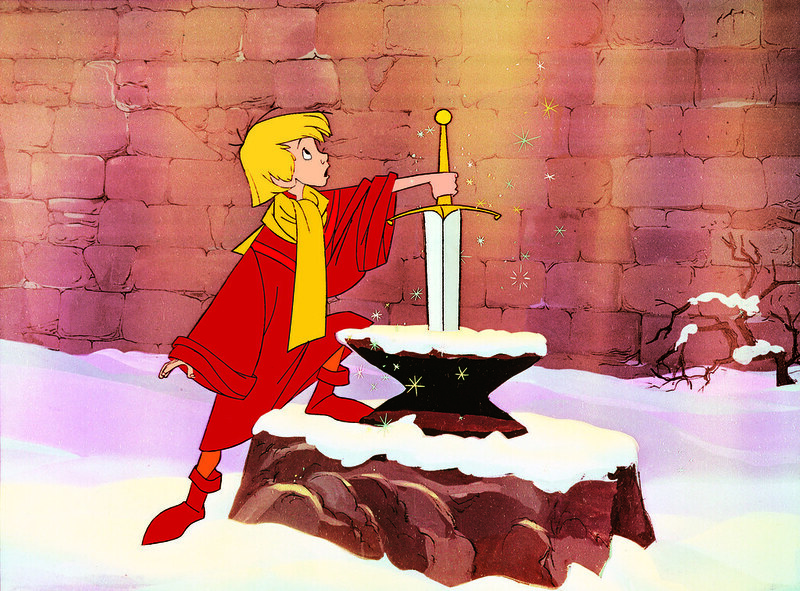 Though more amusing to younger viewers than to adults, The Sword in the Stone – 45th Anniversary Edition has enough nostalgic moments to keep adults semi-amused. It is not the best film Disney ever put forward, but there's still enough magic in the story and music to make for an enjoyable 79 minutes.